This month we'll start the Baking For Business In Kenya Series. We know there are lot of people interested in starting a small bakery or those like us who have already started (yay ^_^) and may need tips on ingredients, equipment or some recipes for baking for business in Kenya. We will cover all those topics in this series and we hope this will help any business bakers in Kenya. Today's post will deal with types of flour a small bakery requires in their stock, depending on the different baked products in the menu. All-purpose flour is a versatile flour that can be used for most products, hence the 'all-purpose' name. 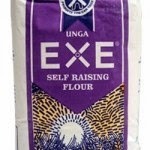 If you're starting a small bakery business in Kenya, it's imperative to have this flour in your stock. Major wheat flour brands offer all purpose flour in bales, most commonly of 12 pieces of 2 Kg flour packets. Make sure you purchase it in the bales since it's more economical to do so. 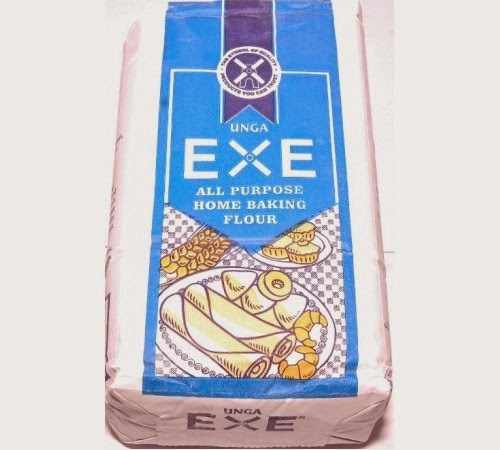 Get a good quality brand, such as EXE from Unga Ltd to ensure good quality products. This flour can be used to make cakes and cupcakes in your small bakery menu. You can talk to your local wholesaler and ask about pricing and if you will buy large quantities, they can offer delivery to your small bakery. All-purpose flour bales range from Kshs. 1500 to 1700; depending on the supplier, current economic climate and location. Self-rising flour is a wheat flour that is added raising agents, ready for use. If your small bakery menu will consist of cookies and/or sponge cakes, this is an important flour to have in your stock. Major wheat flour brands also offer self rising flour in bales of 12 pieces of 2 Kg packets as well. Your local wholesaler can also provide this flour for your small bakery. The bales range from Kshs. 1560 to 1800, depending on the supplier, current economic climate and location. Bakers flour is a wheat flour used for commercial purposes for making bread and scones. It has a high gluten content and is therefore ideal for the making of yeast products. 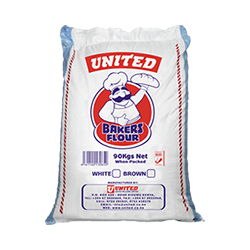 Bakers flour is offered by brands such as Premier Millers, Pembe Millers, United Millers, Maisha Flour Mills etc. It comes in a 50 Kg bag and ranges from Kshs. 3000 to 4500. Bakers flour comes in white and brown flour versions. If your small bakery menu will consist of bread, scones or buns; you should make sure you have this flour in your stock. It's more economical to use than all-purpose flour for the yeast products and yields better results as well. If you're not purchasing directly through the millers (they prefer large bulk purchases), some local wholesalers in different areas can order for you. Just let your wholesaler know in advance and they will order for you. 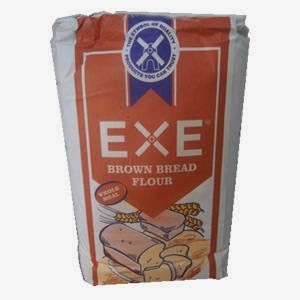 This is a whole meal flour used for the making of healthier baked products such as brown bread, brown scones, whole meal cookies etc. If your small bakery menu will have whole meal products it is ideal to have this flour in your stock. If you already have the whole meal bakers flour, you do not need this flour, but if you cannot be able to have large bakers flour stock, you can start with this type of flour for now. It comes in 2 Kg packets and can be sold in bales of 12 packets. Price ranges for the bales are from Kshs. 1600 to 1900 depending on location, economy and brand. This is a commercial flour used for the making of biscuit products. It comes in 50 Kg bags. If you want to concentrate on selling biscuits in your small bakery menu, you should make sure you have this flour in your stock. Most of the large milling companies offer this flour. It is also used in the making of pie crusts if you include pies in your menu. Those are the most important flours required to start a small bakery based on most bakery product menus. Stay tuned for more on ingredients required to start a small bakery in Kenya. If you want to learn how to bake in order to start a small bakery, you can sign up for our Baking Classes to get started today. You can also buy our book on "How to startup a small bakery business successfully." Click here for information on where to find it and at how much. We also offer monthly bakery business classes; click here for information on the topic, dates and how to book our next class. This information is so useful. Expecting to start business by January and I should admit your posts have been so informative. One of the things you have advised starters is to buy in bulk. Being new in Kenya, where do i get wholesale shops in Roysambu for things like butter, sugar, flour and so forth. Hi, thanks for reading and very welcome.